It's the last Monday of the month and you know what that means! A Guest Muse! You know her and you love her cards, based on the number of times she's been selected as a Featured Member or Honourable Mention! We also have a change to our timing which we think you'll like - read below for details on changes to voting times! Vote for 3 of your fellow member's submissions that you think best used the inspiration from the Muse card. Voting will begin immediately after the Inlinkz closes at 8:00 am EST on Monday. Please don't forget to come back and vote for 3 of your fellow member's submissions. Voting ends on 8:00 am EST on Tuesday. The results of voting will be announced at noon EST on Tuesday. Our new challenges will continue to begin at 9:00 a.m. EST on Monday. We hope that this change will give you more weekend time to create a card and enable even more of you to participate. Please leave a comment below and let us know what you think of this change. And please let us know if you have any other ideas that will help Muse improve and make it even better for all participants! A good Monday morning to all of you at Muse! In regards to the changes you are making, my only suggestion is that you send out a reminder notice about voting in a more timely manner. I love to vote each week but found that I had to remind myself about the voting because the voting reminder notice never arrived in my mailbox until 2 hours before the cut off time. It would be so helpful if you could send out these reminders immediately after the Inlinkz closes at 8:00 a.m. EST on Monday. That would give more than adequate time for everyone to receive their voting reminders and to have the joy of voting. I’ve REALLY enjoyed this wonderful Muse challenge . . . the cards are always such high quality and the voting is the highlight of this card-maker’s week! Rita - thanks for your suggestion - you're absolutely right that a more timely reminder would likely help more people vote. Based on your comment, I think you are following us by Email - most people seem to get the posts in their email the next day. I do not send those reminder posts, they are automatically generated by Blogger - I will have to investigate to see if we can change that timing. If you follow us in a reader such as Feedly (there are others, but Feedly is the one I use, so I know it works this way), the reminder pops up there immediately after it is posted. I'm glad you're enjoying Muse and I hope that we can find a way to make it even easier for you to participate! Ardyth ... thank you for your kind response! I agree with Rita and wish the emails came the day they are actually sent, but unfortunately, for some reason, ALL email subscriptions arrive the following day, so when we receive them, it's already a day late? I realize this had nothing to do with you gals and have always wondered why this happens? ANY ideas? I guess Feedburner (Google) really is responsible, but its' a bummer, nonetheless! I think the change of time probably will work better for me, especially in the summer when I may be away for the weekend, or doing outdoor activities Saturday morning. Beautiful card Anita! Love the playful sequins on the thin lines. Thanks so much for changing the timing of the challenge! I've missed getting in on the fun a few times and need my weekend to be a part of the fun. Love your challenges - they are so much fun! 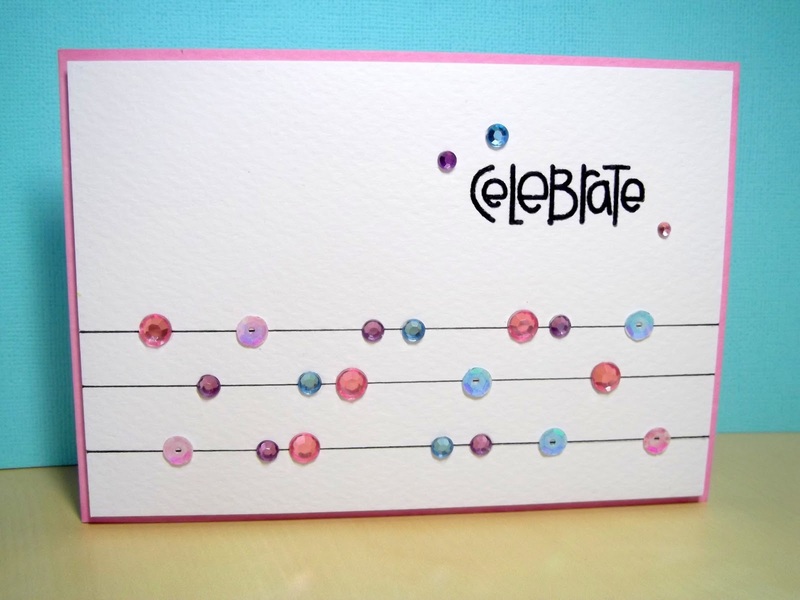 What a great card by Anita...I am so glad to be able to play along this time around! Terrific card by Anita! This should be a fun challenge! Pretty card, thanks for the inspiration. Anita - what a fantastic card! Ardyth and the MUSE Team - your ideas to give us some weekend play time, especially for me, somewhat organizationally challenged! MUSE is awesome!! Congratulations again to Anita! This was a cool one!! Oops, I forgot to comment on the changes. I think they are wonderful! I've actually missed a few just because of the timing, so I think this will help improve the participation. I also agree with Rita about the stupid Blogger thing, but realize that's out of your hands. For those of us on PCs, the immediate notice from the readers doesn't help. We rely on Feedburner or Blogger, whoever sends out the posts. Getting in touch with someone there is like speaking personally to Santa Claus. For some reason I am unable to vote. It is 3:25 pm EDT in Ohio and the usual "vote" symbol isn't available. Suggestions anyone? Denise - if you can see the little hearts, you can vote. Click on the hearts on the 3 cards you want to vote for. Please let me know if you are still having trouble!